Fragrance & Light, An Inspirational Year and Fruit of the Month each make the perfect present. Each collection consists of 12 wonderfully scented votive candles packaged in a beautiful illustrated gift box. 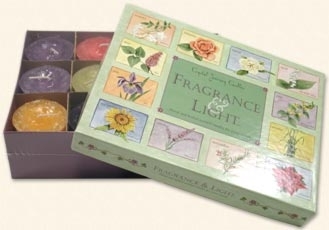 Fragrance & Light includes floral and herbal scented candles inspired by nature's changing seasons. An Inspirational Year contains a selection from our ever popular herbal line and Fruit of the Month contains tempting fruit scented candles for every month.